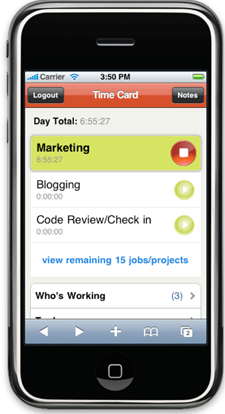 TSheets, a web enabled timeclock tracker, has just introduced an iPhone web app version of its site. The web application allows users to clock in or out of work from a remote location, and also gives professionals a handy way to keep track of their billable hours. The app itself is very basic, amounting to what appears to be a stopwatch with categories – you can assign a label to each chunk of time spent so that your boss can follow what you’re doing. While the app displays a timer in real time, there’s no reason to leave the app open and drain your battery – the server will monitor the elapsed time until you reopen the app and clock out. The ability to clock in to work remotely may seem counter intuitive (wouldn’t people be more likely to fudge their working hours? ), but CEO Matt Rissell says that TSheet’s service has seen a steady stream of customers since the site’s launch last year. Besides the iPhone app, TSheet also offers integration with Jott, allowing users to clock-in over the phone. While this version of the iPhone app is limited to the Safari browser, TSheets plans to release one through Apple’s App Store in the near future. There are a number of sites with similar offerings, which include Harvest and ClockSpot.